Cloud infrastructure refers to the hardware and software components -- such as servers, storage, a network and virtualization software -- that are needed to support the computing requirements of a cloud computing model. Cloud infrastructure also includes an abstraction layer that virtualizes resources and logically presents them to users through application program interfaces and API-enabled command-line or graphical interfaces. In cloud computing, these virtualized resources are hosted by a service provider or IT department and are delivered to users over a network or the internet. These resources include virtual machines and components, such as servers, memory, network switches, firewalls, load balancers and storage. In a cloud computing architecture, cloud infrastructure refers to the back-end components -- the hardware elements found within most enterprise data centers. These include multisocket, multicore servers, persistent storage and local area network equipment, such as switches and routers -- but on much greater scale. 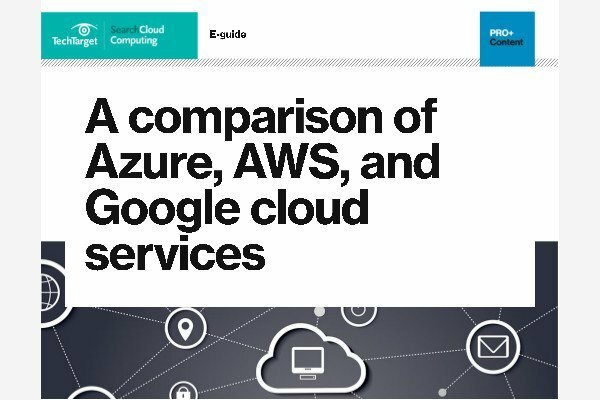 Major public cloud providers, such as Amazon Web Services (AWS) or Google Cloud Platform, offer services based on shared, multi-tenant servers. This model requires massive compute capacity to handle both unpredictable changes in user demand and to optimally balance demand across fewer servers. As a result, cloud infrastructure typically consists of high-density systems with shared power. A view of a typical cloud infrastructure, which includes servers, applications, clients and other components. Additionally, unlike most traditional data center infrastructures, cloud infrastructure typically uses locally attached storage, both solid-state drives (SSDs) and hard disk drive (HDDs), instead of shared disk arrays on a storage area network. The disks in each system are aggregated using a distributed file system designed for a particular storage scenario, such as object, big data or block. Decoupling the storage control and management from the physical implementation via a distributed file system simplifies scaling. It also helps cloud providers match capacity to users' workloads by incrementally adding compute nodes with the requisite number and type of local disks, rather than in large amounts via a large storage chassis. Cloud infrastructure is present in each of the three main cloud computing deployment models: private cloud, public cloud and hybrid cloud. In a private cloud, an organization typically owns the cloud infrastructure components and houses them within its own data center. In a public cloud model, the cloud infrastructure components are owned by a third-party public cloud provider. A hybrid cloud consists of a mix of both models. While cloud infrastructure is the hardware and software components required for cloud computing, infrastructure as a service (IaaS) is a cloud model that gives organizations the ability to rent those IT infrastructure components -- including compute, storage and networking -- over the internet from a public cloud provider. This public cloud service model is often referred to as IaaS. IaaS eliminates the upfront capital costs associated with on-premises infrastructure, and instead follows a usage-based consumption model. In this pay-per-usage model, users only pay for the infrastructure services consumed, generally on an hourly, weekly or monthly basis. Cloud providers typically price IaaS on a metered basis, with rates corresponding to usage at a given level of performance. For virtual servers, this means different prices for various server sizes, typically measured as an increment of a standard virtual CPU size and corresponding memory. For storage, pricing is typically based on the type of storage service, such as object or block, performance level (SSD or HDD) and availability -- a single storage location or replication across multiple geographic regions. Capacity is measured by usage per unit time -- typically per month. IaaS vendors also provide discounts for sustained usage, or the use of a consistent level of compute capacity for a specified amount of time, or reserved capacity, where users can prepay for a guaranteed level of capacity for a month, year or multiple years. IaaS vendors include AWS, Google, Microsoft Azure and IBM. What are the biggest challenges you've faced when deploying or managing cloud infrastructure? Which cloud infrastructure service does your organization use?